Group will subsidize your cost will only be $18.00 per lead. of refusal to Kaiser Financial on the leads. We also can also do customized email blast Marketing for various products to business and consumers in your area. 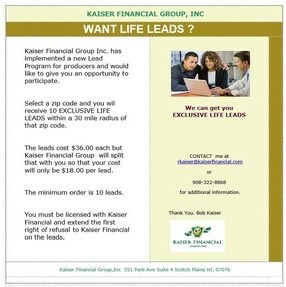 e-mail me at rkaiser@kaiserfinancial.com or call me at 908-322-8868 for additional information.